All good things must come to an end, right? And if you remember Vegas Grinders, you know we were big fans of the MegaBeat Jackpot, a progressive multi-property payout. Though none of us cashed in, the promotion was enough to draw each of us (and many of you) to various Caesars property poker rooms on repeat occasion. Anyhow, promotions naturally change, and it’s been about a year that the MB was in play, but there does seem to be some decentralization going on at Caesars- and WSOP-branded poker rooms in Las Vegas — or maybe it’s more of a recentralization? — which may or may not have anything to do with different rooms getting autonomy while others prepare for the axe. Wild speculation, but we do know that email addresses have changed recently, with a promo list like the one below coming from @caesarspalace.com instead of @caesars.com … and these sorts of changes seldom happen for no good or apparent reason. M Resort closed its 14-table poker room [earlier this month] to make space for additional slot machines that will be used for tournament play. Rina Foster, a spokeswoman for the casino, said employees displaced by the closure were offered other jobs, although she wasn’t sure how many were moved to new positions. M Resort is owned by Penn National Gaming. She said the space layout is still be reconfigured and M Resort has not determined how many slot machines will move in the space. Foster said the property’s customers wanted a better location for slot tournaments. “Currently tournaments are held in a ballroom and with the new area, guests will be able to play on our floor with better access to our amenities and easy access to self-parking,” Foster said. 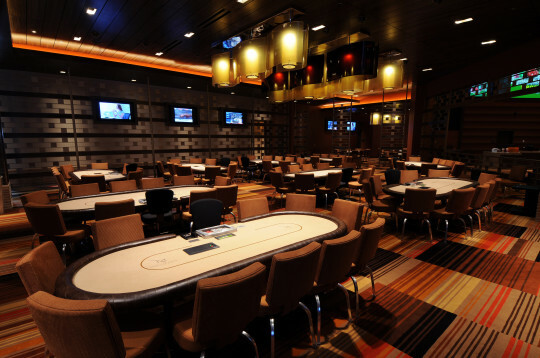 M Resort still plans to host custom poker events, such as the Hollywood Poker Open that was held at the end of June. The $500,000 tournament featured players who qualified at Penn National properties across the U.S. The tournament was held in the M Resort convention area. Foster said next year’s Hollywood Poker Open is already being planned for M Resort. 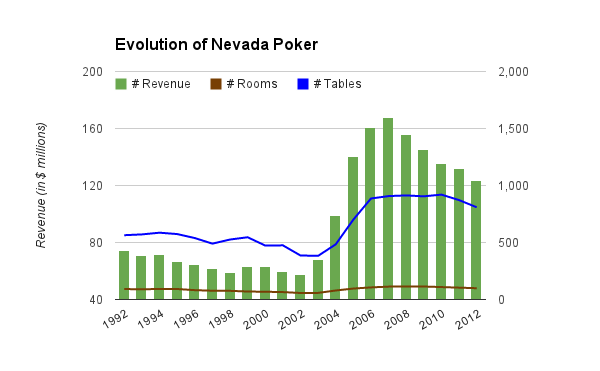 UNLV’s Center for Gaming Research put out some data collected from NGCB’s Gaming Revenue Reports that paints a rather interesting picture of the poker world over the past 20 years. The chart you can see here — showing the number of poker rooms, the number of tables, and total rake — pretty much tells the story of poker … and I couldn’t help but want to graph it! What I’m not sure of is whether or not these numbers include tournament entry fees or represent only cash game collections. But either way, even with the WSOP finding creative ways to report definitive growth year over year, I’m fairly certain the shape of both graphs would look pretty much the same. Super Bowl Sunday is arguably one of the best days of the year for a Vegas grinder. In this town, the game is one big gamble, as evidenced by the pages and pages of prop bets offered exclusively on the NFL championship. If you’re playing at Mirage, you’ll be hoping that there’s as much action on the felt as inside the Superdome. They’ll draw a seat number after just about every big play. An interception is worth $50, a fumble is worth $75, a play of 76 yards or more is worth $100. Field goals are worth $25-$100, depending on the distance and touchdowns are worth $100. There are also four pre-game drawings for the four hours before kickoff: $125, $100, $75 and $50. Players at Excalibur earn can earn raffle tickets before and during the game. They’re paying $50 for field goals, $100 for touchdowns, and $400 for safeties, along with a drawing for $100 at the end of the first three quarters, and another for $200 at the end of the fourth quarter. The Monte Carlo promo could end up costing you money if you play favorites. 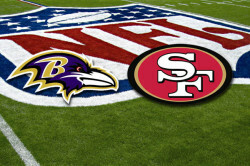 They’re giving away raffle tickets for full houses, and players must place their tickets in either a 49ers bin or a Ravens bin. When either team scores, they’ll pull a ticket for $50 for field goals, $100 for touchdowns and $200 for safeties. The Luxor is giving out raffle tickets every hour for the first four hours before the game and every quarter during the game. Then there’s a drawing after each field goal for $25 and after each touchdown for $50. At Mandalay Bay, they plan to give away $500 for the high hand of each quarter. The minimum qualifying hand is 10s full, and if no one hits, the prize jumps $250 more for the next quarter. The oft-overlooked Circus Circus (because they rarely have much more than a 3/6 limit game) is offering $100 to the high hand every quarter, and $100 for the high hand of the hour from 8 p.m. to midnight. Instead of cash, the Flamingo will splash pots with hats, T-shirts, hoodies, and polo shirts after each score and after each quarter. I tried to hit it last week — flopped quad bullets at Planet Hollywood with two fish betting into me — but couldn’t lose to win. After I relayed the story to a math-minded pro friend who told me that, because of the board, there was no possible hand that could have beat me and I should have raised at some point prior to the river. But for this new Caesars Megabeat Jackpot, it doesn’t have to be you: 20 percent of the jackpot goes to the player with the losing hand, and 10 percent to the player with the winning hand; But 70 percent is distributed to players at all Caesars properties in the state. Because of this promo, they’re not offering high hand bonuses. Which means I was a few days late for being good enough to actually win with quads. Is that a bad beat? For most of last year, poker players in Las Vegas could find at least one place to earn something of an hourly wage on top of the chips they collected at the table. But that trend has all but vanished in 2013. Poker rooms have essentially stopped encouraging grinders to fold all day long. 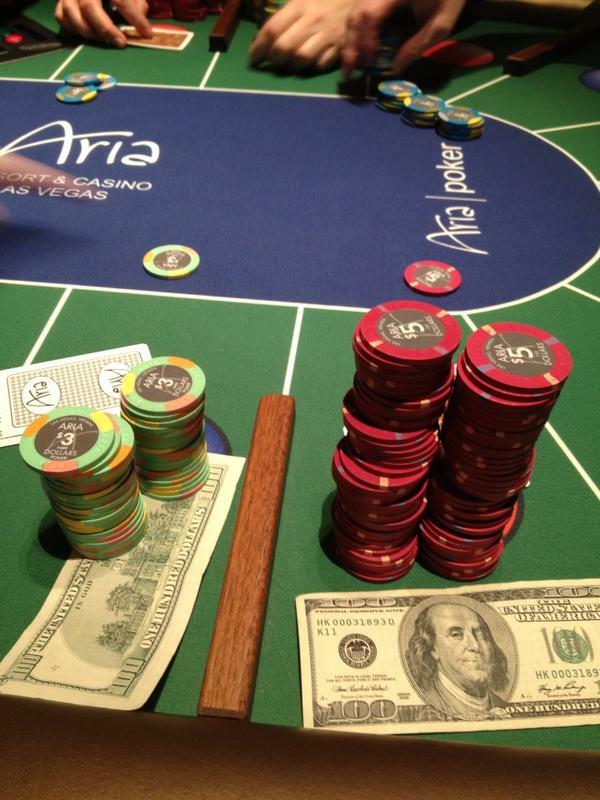 Here’s some video the new Multi Action Poker game Dave is talking about at Aria in action. While one player at the other end of the table is telling the creator of the game how it should be played, our @RandomPoker reporter in the field is seen quietly taking down a pot. One player per hand!? 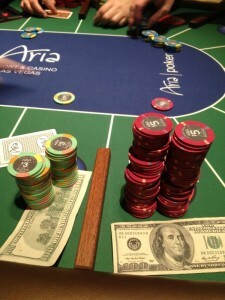 Dave’s multi-stacks at the debut spread-limit hold’em multi-action game @AriaPoker. Aria Poker launched Multi Action Poker yesterday, a game designed to woo those tired of playing just one hand at a time in a live setting, and perhaps those who miss the concept of multi-tabling online. In forums and at the tables, players questioned whether the game would succeed. Even some Aria dealers said they knew little about how it would be played. But the game’s inventor, Timothy Frazin, is counting on a hit. He said he’s conducted several trial runs and worked out many of the concerns. Though a table with two dealer cutouts and wooden slats protruding from the rail might look confusing, the game is simple at its core. Each player is dealt two separate hands, placed over a red spot and a blue spot, separated by a wooden slat, for the respective hole cards and chip stacks. There are nine players, two dealers facing each other in the center of the table, four decks (two being shuffled, two in play), and ideally two differently colored chip stacks. “It’s like a football field,” observed one player checking out the new table for the Multi-Action game. Fully Tilted? 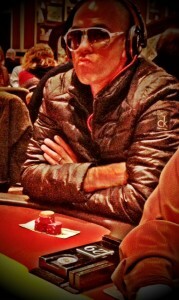 Nick DiVella is still waiting for his roll from a player sometimes seen in the Ivey Room at Aria. Howard Lederer might be re-emerging in the nosebleed cash games of Las Vegas, but some players are so upset about the former Full Tilt leader’s return to the felt that they began circulating a petition to get him banned from live poker. “We believe the casino has a moral and ethical obligation to bar Howard Lederer from playing in the poker room and should Aria casino fail to take immediate action we, the poker playing community, will be forced to boycott the poker room,” the petition reads. Local pro Nick Divella, 24, crafted this plea to fellow players at Aria, asking them to boycott the room if Lederer was allowed to play there again. Aria management, however, had “a long talk” with him explaining why they had to remain neutral and couldn’t allow him, or anyone for that matter, to solicit signatures on their property. DiVella, a regular in the 5/10NL and 10/20NL games, said he had talked to upwards of 50 players who already had agreed to sign it, and has since taken his cause online. “It tilts me to no end,” explained DiVella, who says he loves playing at Aria but but doesn’t want to see the disgraced Full Tilt empresario sitting behind big stacks in his favorite poker room, as it would almost certainly have a negative impact on his own non-Ivey Room play. The WSOP crowned its newest champion this week, but that doesn’t mean tournaments around town are done for the year. Heartland Poker Tour makes its next stop at Palms. The tournaments run today (Friday, Nov. 2) through Nov. 11, culminating with a $1,650 main event. This is probably a good series of events for those who want to try their hand tourneys, or players like me who don’t want to spend a bunch on donkaments. It’s essentially a group of at least 7 satellites every day leading up to the big one. Ante Up Magazine’s new poker tour starts later this month at Thunder Valley Casino Resort near Sacramento, where the main event comes with a $200,000 guarantee. They’re also hosting events in Minnesota and Oklahoma leading up to a world championship at Hard Rock Punta Cana in the Dominican Republic. Man, tournament players might have a higher variance grind, but at least it can be exotic. Ante Up also announced its next Vegas event would be held at Red Rock Casino from Jan. 21-27. The event schedule has yet to be released, but the series will culminate with a $1,100 main event with three Day 1s, which will “spill over into the Rocks Lounge,” according to the magazine. Sounds like they might have more than a few splashed pots. My best shot at a bracelet just passed me by. Jokers Wild Casino closed its poker room! The home of the practically secret monthly bracelet tournament in Henderson played its last hand on Halloween night. They didn’t give a reason for the shutting down, but cash games there were often hit or miss, and staff members told me that some of their regulars had been rounded up by nearby Club Fortune Casino. 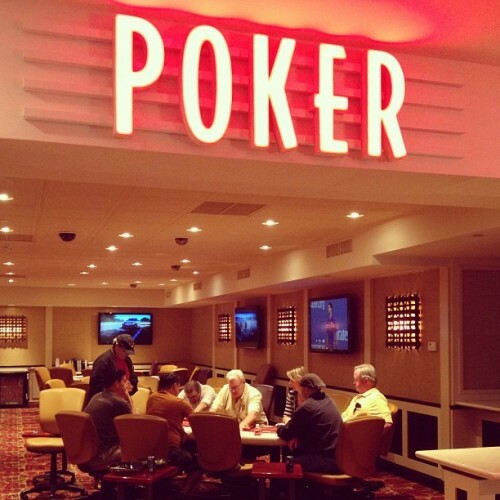 And it wasn’t the only locals poker room on the outskirts of Las Vegas to close this week. The former Aliante Station, now Aliante Casino and Hotel, also shuttered its poker room after being taken over from Aliante Gaming LLC. The North Las Vegas casino was sold as part of Sations Casino bankruptcy and reopened under the new name Thursday. I never played in their poker room, but if they ever decide to re-open — a la Silverton — I might have to check it out. Ah, the Las Vegas fall. It’s that time of year when the high temperatures finally drop into the 90s, pool season ends, barbecues begin and we enjoy a brief respite from the melting cars. 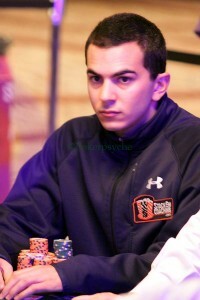 But the live poker scene around Las Vegas is starting to heat up again, after the summer break from the WSOP. Three of the big four rooms — Venetian, Bellagio, Caesars — are hosting fall tournaments. And the WSOP Main Event final table returns to the Rio later this month. 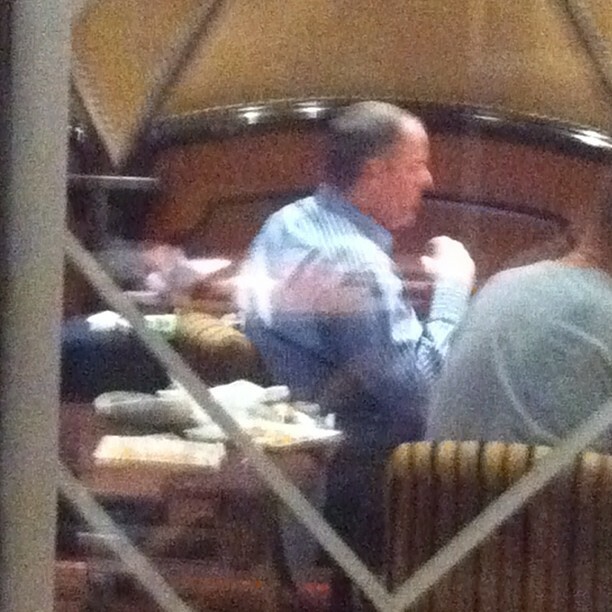 Even Howard Lederer made a ballyhooed return to high stakes cash games at Aria and Bellagio this week. He played in Bobby’s Room on Monday, the Ivey Room on Tuesday, and found his way back to Bellagio on Wednesday with a nosebleed crew that included Doyle Brunson, Eli Elezra, Chau Giang, and Nick Schulman. Lederer’s given no indication where he’s headed next, but I imagine he’s a little more than a DOJ seizure away from the .50/$1 game at Bill’s. I wanted to snap a picture of Lederer when I saw him at Aria, but security threatened to ban anyone who did, and Dan’s not paying me enough to risk arrest or deportation, so … this twitpic posted to 2+2 will have to be good enough. 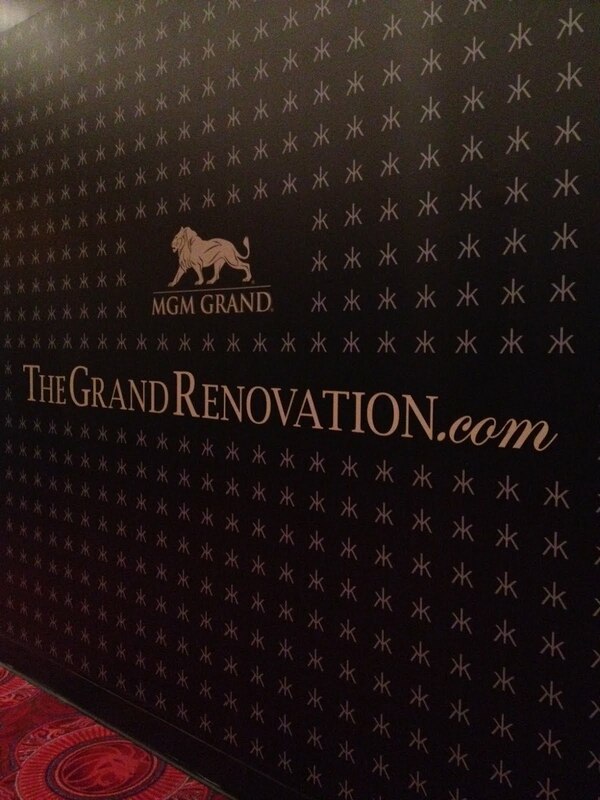 Red-ish Carpet: Because of ongoing renovations at MGM, the Brad Garrett charity tourney will take place in a temporary area between Wolfgang Puck’s restaurant and the Cirque du Soleil’s KÀ theater. Brad Garrett has been a character around the poker scene for a while — pretty much since everyone in poker started loving his fictional brother and real life home-game buddy. On Saturday, Garrett hosts a $250 buy-in charity tournament at the MGM Grand, with a top prize of $10,000. Fellow sitcom star and WSOP notable Ray Romano says he’ll be there. Others expected to join the action include actresses Elizabeth Perkins and Mimi Rogers, 2008 WSOP Main Event third place finisher Dennis Phillips, and, of course, MGM poker room ambassador Karina Jett. MGM officials expect upwards of 300 entrants for the event, which offers $100 rebuys and add-ons. Proceeds from this event go to the Maximum Hope Foundation, a group Garrett founded 12 years ago to provide “compassionate, practical assistance” to families caring for a child with life-limiting illness. Cards in the air tomorrow at noon. Sit-n-Go-Away: The Tropicana Poker Room tried everything, but just couldn’t get enough action to stick. I went to the Trop poker room Wednesday night, about 10:30, to see if a few friends might be working or playing. The room was totally dark but for a single flickering light. No dealer in a box, no suit at the counter. It seemed odd, but the room had been growing noticeably quieter in recent weeks. Sure enough, the new Tropicana Poker Room, which opened on Black Friday and briefly enjoyed a stretch as the Jamie Gold Poker Room, is closing tomorrow. Supposedly for good, with its current space, next to the CantorGaming Sportsbook, slated to be transformed into a special area for slot tournaments.